CENTRAL BANKS choosing to buy gold in 2018 saved the metal from its worst year for global demand since the economic crash of 2009, new data showed Thursday. 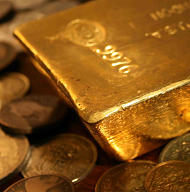 Gold prices meantime extended their New Year 2019 surge after the US Federal Reserve held its key interest rate unchanged. Promising to remain "patient" on further hikes, Fed chairman Jerome Powell also said the US central bank may stop reducing its balancesheet – swollen four-fold to $4 trillion by 'quantitative easing' following the global financial crisis of a decade ago – sooner than previously expected. Dollar prices to buy gold in London's wholesale market – centre of the world's bullion trade – hit new 8-month highs at $1324 this morning. 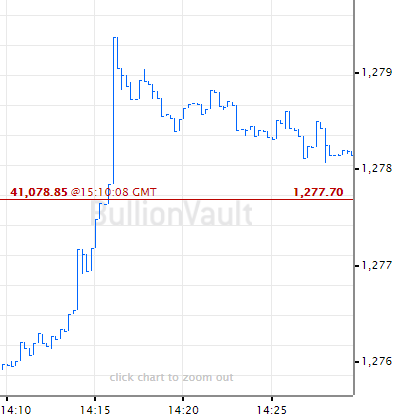 But gold prices rose faster for Eurozone investors, reaching the highest since April 2017 above €1150 per ounce. Without last year's 73% rise in central-bank gold buying, total global demand for the metal would have barely reached 4,000 tonnes in 2018 according to Thursday's new data, presented by the mining industry-backed World Gold Council. 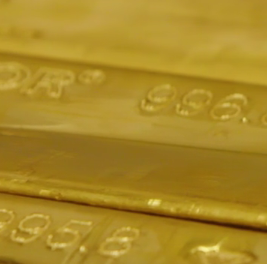 European Union members Poland and Hungary shocked analysts in 2018 by joining Central and East Asian central banks in buying gold. 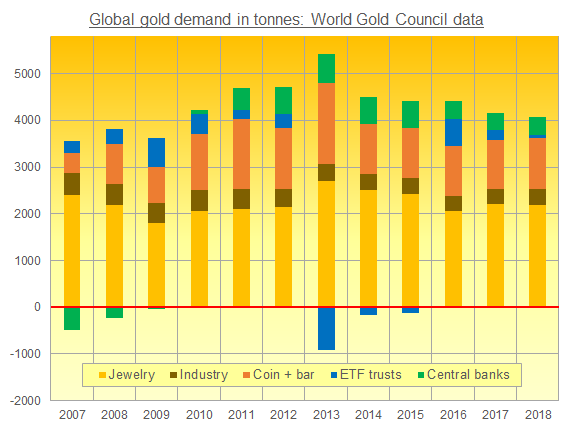 As a group, demand to buy gold by central banks totaled over 651 tonnes in 2018 on the new figures, compiled for the World Gold Council by specialist analysts Metals Focus. The second highest yearly total on record according to today's release, that offset a drop in demand to buy gold-backed ETF trust fund products among money managers and other investors, and rescued full-year demand from what would have been the lowest total in a decade. Demand for fabricated products from households and industry rose 1.3% from 2017 to rally further from the weakness of 2016. But buying gold as jewelry, for electrical, technological or dental use, plus retail investment in gold coins and bars, still came in 3.8% below their combined 10-year average. "Economic uncertainty, slowdown [and the] US-China trade conflict supported investment flows" in late 2018, Reuters quotes the World Gold Council's head of market intelligence, Alistair Hewitt. "The flip side is that it hit some elements of the market," with Middle Eastern suffering from lower household confidence plus a rise in domestic gold prices thanks to weaker local currencies. "This dynamic is likely to run through 2019," the WGC's Hewitt adds. European stock markets meantime struggled on Thursday despite Asia following the US sharply higher overnight following the Fed decision. Silver prices jumped 2.4% for the week, breaking above $16 per ounce for the first time since July. Platinum prices were more muted, recovering early January's levels around $825 as sister metal palladium recovered half of the last fortnight's 8.8% plunge from new all-time highs near $1440 per ounce.